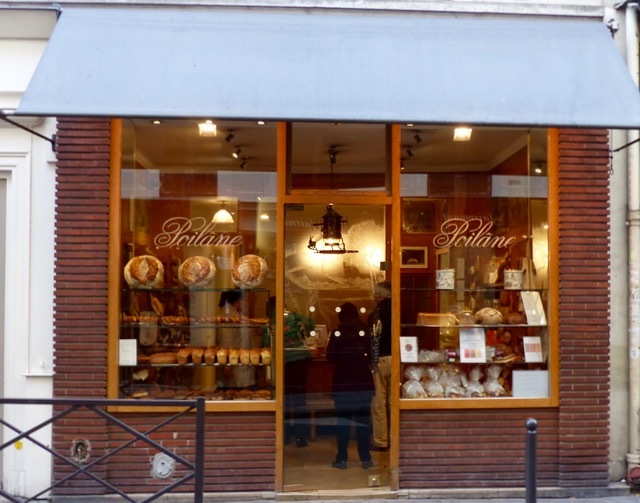 Just a few minutes walk from our Paris flat, on rue cherche-midi, was the venerable bakery or boulangerie, Poilâne. 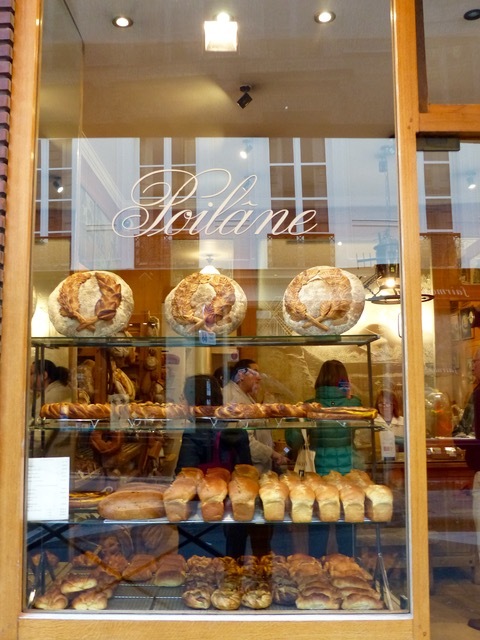 Early one morning, just as the bakery was scheduled to open, we vowed to do a “croissant crawl” through Paris, and we started at Poilâne (perhaps better known for its sourdough bread). The tragic circumstances of Lionel Poilâne’s passing along with his wife in a helicopter crash many years ago, just as his 18 year old daughter was set to matriculate at Harvard University, is a story that struck a chord for a parent of a single child. Kudos to the daughter, who continued with her studies while managing the business from afar, and she is now firmly at the helm of a huge enterprise. 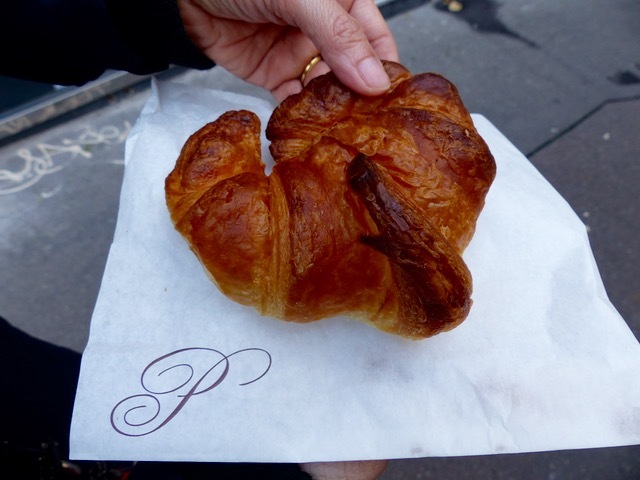 We forgot to discuss what croissant to taste that morning, and Mrs. MM emerged from the shop with a single nicely burnished and rather plump croissant in a crescent shape. It had a flaky exterior and chewy interior. It was nice, but honestly, a bit of a letdown for Poilâne, where expectations are always high. But never mind, they have so many other spectacular nibbles at Poilâne, I am not going to quibble. 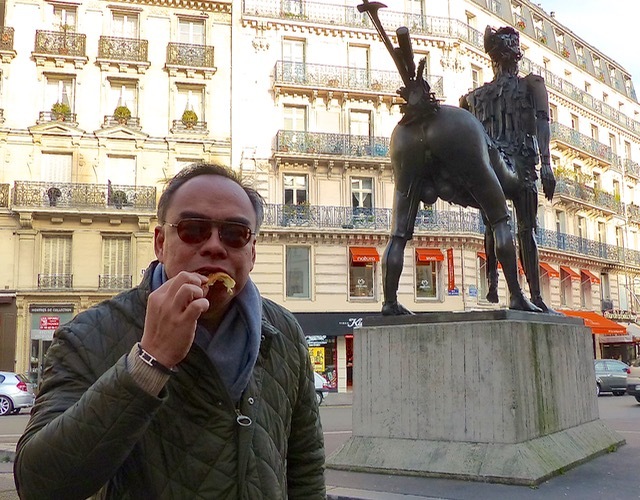 Suffice it to say it was better than any croissant I can get in Manila, but not amongst the very top best we tasted in Paris. It should also be said that croissants should only be enjoyed in the morning, when they have just come out of the ovens. So the taste challenge was also time sensitive. Suffice it to say we didn’t get to too many shops in all, as eating 3-4 croissants in a single morning is enough to blimp you out big-time! Now if only I thought to bring some of sister’s jam to enjoy with the croissants we would be tasting! Croissant trivia: although croissants are commonly known as a French culinary ‘institution’, they were really invented in Austria by Viennese bakers. Sister’s jams would have really gone well with them…I can just imagine her prize winning Buddha’s hand marmalade citrus flavour cutting through the buttery divine fat of the croissant! Yum! 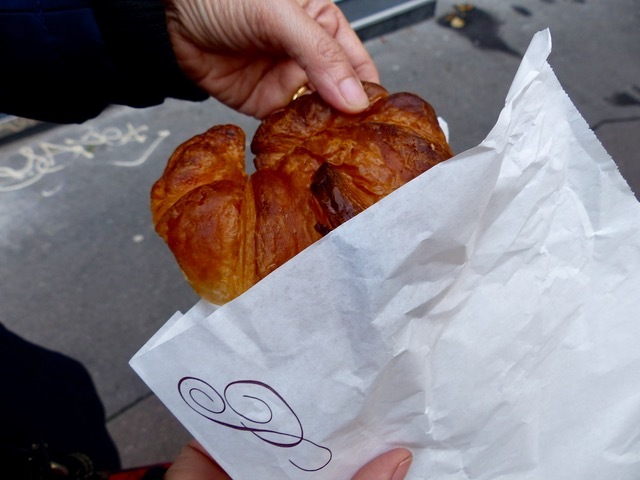 If you happen to be in the Canal Saint Martin area during your trip, try Du Pain et des Idees (http://dupainetdesidees.com/). It supplies Alain Ducasse and has a lovely traditional shop. It is not too far from the Hotel du Nord, made famous in the movie of the same name. Try their utterly delectable escargots or tourbillons made out of croissant dough, lined/stuffed with pastry cream, nuts and/or fruit and rolled. Make sure you bring some of Sister’s sweets for THIS trip.. Yum! Three years back, I inquired from Poilane if they can ship to Manila. Interestingly, they replied and apologized saying they only ship to Japan. ;) Btw, I may have missed your post re winner of your extra cookbooks contest. I wonder who won? Have a great Parisian vacation to both of you. I’m excited to visit Zubuchon Cebu in two weeks!